A professional Lecturer and Astronomer and therefore an individual who can speak with authority on almost any space related matter. Andy is Director & Senior Lecturer at StarDome – Astronomy & Astronautics, a Fellow of the Royal Astronomical Society and a Fellow of the British Interplanetary Society. 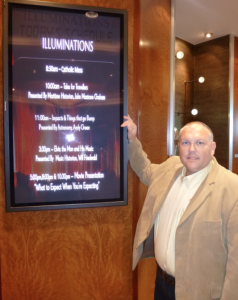 He is also a “Cunard Insights” Lecturer for Cunard on their Ocean Liners and an Astro Travel Guide/Astronomer specialising in eclipses and Aurora. Andy is very fortunate to count Charlie Duke (the 10th Human Being to walk on the surface of the Moon) as his very good friend and he often accompanies Charlie during his visits to the UK. 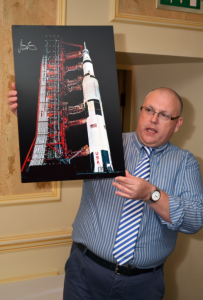 Andy has met many of the Astronauts and support staff involved in the Apollo program including many of the astronauts and 9 of the 12 men who walked on the moon. Andy is able to deliver many fascinating talks on a wide range of space related subjects, especially Apollo, his “One Small Step” lecture has been presented to many audiences over the years and is an insight into the origins of the “Space Race” and how the Apollo program had its successes and failures culminating in the ultimate goal of landing men on the moon and returning them safely to the earth. For more detailed information visit Andy’s websites.